The government of President Pervez Musharraf is facing policy failure in the Federally Administered Tribal Areas (FATA) of Pakistan. Taliban forces and their sympathizers are becoming entrenched in the region and are aggressively expanding their influence and operations (especially in Tank, Dera Ismail Khan and Swat Valley in the North-West Frontier Province). A lethal combination of Musharraf's political predicament and declining public support, a significant rise in suicide attacks targeting the army and the reluctance of soldiers deputed in the area to engage tribal gangs militarily further exacerbates this impasse. Observing this, many militants associated with local Pakistani jihadi groups have moved to FATA to help their "brothers in arms" and benefit from the sanctuary. In the midst of this, election season is descending upon Pakistan and Musharraf's survival prospects are diminishing. This dim scenario has consequences for Pakistan's policy in the FATA region. Pakistan will predictably revert to "peace deals" in the short-term, leading to a lowering of the number of military checkpoints in the area (Daily Times, September 23). If history is any indicator, this will help Talibanization in the region and provide more opportunities to the ISI to indirectly support some Taliban commanders sympathetic to Pakistan's objectives. Overall, this will likely reduce trouble in downtown Islamabad, but the Pakistan-Afghanistan border area will remain on fire. Poor coordination between the Pakistani army and NATO/ISAF, Hamid Karzai's failure to make Afghanistan a functional state and the abundance of drug money in southern Afghanistan are some of the important variables in this context. Additionally, Musharraf himself admits that the crisis in the area is increasingly turning out to be a Pashtun insurgency. However, the factors that "limit" Pakistan's effective clampdown on all things Taliban in FATA remain linked to its fear about increasing Indian influence in Afghanistan if the Taliban are comprehensively defeated, and the lack of Pakistani public support for anything that appears to be done in pursuance of the U.S.-led global war on terrorism. These perceptions significantly affect the morale of army commanders and soldiers operating in the region. Musharraf has largely failed to make a strong case to his people about the need for strong military action against the Taliban in FATA. He has often called this policy as being in the "national interest," but has not convincingly explained how the army alone defines the national interest. More so, Pakistanis have seen the military defining such interests too often in the past with devastating effects for the state, and interpret Pakistan's current fight against the Taliban in terms of succumbing to U.S. demands and interests. With this backdrop in view, this analysis outlines what is happening today in each of the seven tribal agencies in FATA and what the implications are for Pakistan, Afghanistan and the United States. Bajaur Agency overlooks Afghanistan's Kunar province, where U.S. forces are battling al-Qaeda and Taliban fighters. Al-Qaeda leader Ayman al-Zawahiri escaped the reportedly CIA-led attack at Damadola in Bajaur on January 13, 2006, while one of his close relatives was among the 18 killed. Damadola is considered a stronghold of Tehreek-e-Nafaz-e-Shariat-e-Mohammadi (TNSM) and Jamaat-e-Islami (JI) units, and the Jamiat-e-Ulema-e-Islam (JUI) has representation in parliament from Bajaur (Daily Times, February 13, 2006). Bajaur during the 1980s and 1990s was known as the "Poppy Kingdom," and many Afghan refugee camps (functioning until 2005) were a source of pro-Taliban recruitment in the area. In August this year, talks between the Taliban and a tribal jirga (supported by the Pakistani government) to improve the law and order situation in Bajaur failed as the Taliban wanted the government to first release some arrested militants (Daily Times, August 7). Trouble had broken out in the area with the news of the proposed construction of a U.S. helipad in Afghanistan's Kunar province as the tribal leaders sympathetic to the Taliban framed it as a threat to Pakistan (Daily Times, June 17). The strength of the Taliban in the area can be gauged from two recent events: since July this year, they have successfully enforced Friday as the weekly holiday instead of Sunday, which is the official weekly holiday (Daily Times, July 14); secondly, Abdul Ghani Marwat, who headed the government's vaccination campaign in Bajaur, was killed in a bomb attack in February this year amid the Taliban-sponsored rumor that the Pakistani government-run polio vaccination drive was a U.S. plot to sterilize Muslim children (Daily Times, February 20). The rumor was so widespread (projected by Taliban fatwas) that, according to government estimates (which are always conservative), parents of around 24,000 children had refused to give them the polio vaccine (Daily Times, Feb 20). 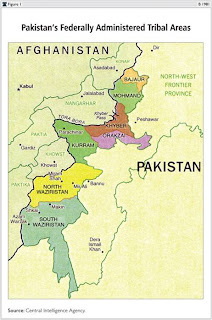 Khyber Agency is the main artery connecting Peshawar to Kabul via the Khyber Pass. Today, many men are seen wearing traditional caps in the agency because of fear, as a local religious outfit sympathetic to the Taliban, Lashkar-i-Islam (Army of Islam), has declared it binding on all men of the agency to wear caps. The leader of the group, Mangle Bagh, in his radio address last week issued this edict and announced that violators' heads will be shaved and they will face a monetary fine (Statesman, September 22). It is pertinent to point out that there is a serious battle going on in the agency between Ansar-ul-Islam—led by Pir Saif ur Rahman—and Lashkar-i-Islam—led by Gul Maiden and Mufti Munir Shakir—since 2005-06 (Daily Times, November 17, 2006, April 1, 2006, December 3, 2006). Both factions have built their militias over the last few years and have entrenched themselves in castle-like strongholds. In essence, this is an intra-Sunni (Deobandi vs. Barelvi) war (Daily Times, March 30, 2006). After banning music in the tribal areas, the local Taliban in Khyber Agency have also started fining taxi drivers and citizens Rs 500 (about $8) for listening to music cassettes in their cars (Daily Times, March 1). Also recently, militants started distributing pamphlets in Bara Bazaar in Khyber Agency saying that the "Taliban have finally reached Bara," while warning that "if anyone tries to hinder our movement and activities, we will launch a holy war against them" (Mashriq, September 3). In comparison to other tribal agencies, Khyber Agency (because of its proximity to Peshawar, the capital of the North-West Frontier Province) is more accessible to Pakistani government functionaries and some development work has been done in the area. For instance, in 2005, Stephen Hadley, the then adviser on national security to President Bush, inaugurated a primary school building project in Surkamar town of Khyber Agency that was financed by the U.S. and Japanese governments in collaboration with the FATA Secretariat (Daily Times, September 28, 2005). Conditions have changed for the worse since then. The extent of the writ of the state can be ascertained from the fact that around a dozen people were killed in June this year when the Taliban attacked the house of the Khyber Agency political agent, Syed Ameeruddin Shah (Daily Jang, June 1). Surrounded by lofty mountains and Afghan territory on three sides, Kurram Agency is the second largest tribal region in FATA. Its headquarters is in Parachinar, just about 90 kilometers from Kabul. According to intelligence estimates, it was also the first geographical point where fleeing al-Qaeda members from Afghanistan landed after the September 11 attacks. Within Pakistan, the route to Kurram goes through Kohat district of the NWFP where permits are obtained to travel to Kurram. Many al-Qaeda militants had moved on to Kohat because Kurram Agency is widely known as pro-Northern Alliance because of its significant Shiite population—a factor that has impacted Taliban objectives in the agency negatively. Shiite-Sunni violence remains the hallmark of this agency, as pro-Taliban factions believe that the Shiites of the area are active against the Taliban and al-Qaeda. Various peace jirgas were instituted to bring peace to the area, but without much success (Mashriq, April 14). In April 2007 alone, around 100 people were killed in sectarian clashes (Daily Times, April 28). The government of Pakistan is planning to construct two small dams in the agency at a cost of 400 million rupees in fiscal year 2007-08 to improve the agricultural sector and thereby improve the economic situation in the area. This will be an important test case for Pakistan, success of which can help the state machinery to increase its control at least in this area as it is an important transit point for cross-border movement into Afghanistan. Sandwiched between Bajaur and Khyber agencies, this area was considered to be a relatively peaceful region. Pro-Pakistan government tribal leaders still have some control, which is evident from the fact that houses of those giving sanctuary to some proclaimed offenders were attacked as recently as last week (Daily Times, September 23). This was in pursuance of a recent peace deal inked between the Mohmand Agency political administration and the Safi tribesmen, in which the Safi tribesmen agreed to not provide any sanctuary to foreigners (The News, September 15). They also agreed to protect government property and allow the government to move freely in the area, ensuring the safety of roads that pass through the agency. The presence of 200 tribal elders during the signing of the agreement shows some element of success on the part of the government, but the very nature of the deal explains that the government's writ was failing before. The relative peace in the agency in the last few years owed a lot to the constructive work done by the Pakistani army in the area in 2003-04—by building roads, clinics and schools (Daily Times, July 15, 2004). One of the secrets of this success was sealing the agency's 68 kilometer border with Afghanistan by the Pakistani army in late 2003 (Dawn, July 14, 2004). Unfortunately, conditions have changed since then. In recent months, Taliban militants occupied two Khasadar checkpoints in the Qandharo and Halimzai areas of Mohmand Agency and snatched weapons from officials manning the post. In early September, 10 soldiers of the Frontier Corps were kidnapped in the area as well (Daily Times, September 3). The most tragic development, however, has been the blowing up of a hospital, al-Sehat, earlier this month. It was built by an NGO and located about 10 kilometers away from the Mohmand Agency headquarters, Galanai. It was meant to discourage NGOs operating in the area as the armed men mercifully forced the hospital staff to leave the facility before the attack (The News, September 17). As early as late 2005, Pakistani Taliban leaders had declared an Islamic state in North Waziristan. Pakistan opted to cut a peace deal with the power brokers in the area in September 2006 (after convincing the U.S. administration of its utility), but the strategy failed (Daily Times, March 2). Now, abductions of government functionaries and soldiers of the Frontier Corps are a matter of routine. The Taliban of the area maintain that direct U.S. attacks amounted to a violation of the peace deal and hence they are retaliating. Roadside bombs are now a common occurrence. Even those providing food to the army units in the area are targeted (Dawn, September 24). For Musharraf, this is the worst of times because given his precarious political situation, any military action before his re-election as president in October this year is expected to backfire politically. Furthermore, he has committed to give up his position as the army chief after the presidential election, which means he will no longer be actively commanding the Pakistani army. Orakzai Agency was also largely considered a relatively better governed area within FATA until 2005, but Shiite-Sunni battles of the adjacent Kurram Agency spilled over, creating sectarian tension that consequently attracted the Taliban to this agency. The quarrel over a shrine that both communities venerate became a point of contention. The government was tardy in resolving the dispute and the political agent of Orakzai Agency unduly sided with one of the groups, further complicating the crisis (Daily Times, October 22). Even before this issue, the Taliban patron in Orakzai Agency, Akhunzada Aslam Farooqui, was known to be a close ally of Taliban leader Mullah Omar (Dawn, November 6, 2001). Like other agencies, Taliban activities are expanding into adjacent districts of the NWFP from this agency as well. In a recent development in Kohat, which is part of the NWFP and borders Orakzai Agency, local Taliban have warned tailors to strictly observe religious codes while sewing clothes for men and women. In a letter sent to tailors, the Taliban threatened to blow up the shops of those not following the orders (Dawn, September 24). South Waziristan is at the center of Taliban and al-Qaeda activities in the region along with neighboring North Waziristan. Recently, Mehsud tribesmen aligned with Taliban forces abducted 205 Pakistani troops (135 army soldiers and 70 Frontier Corps troops) along with seizing 20 of their vehicles. The most striking fact, however, is that the government forces offered no resistance while being kidnapped. After more than three weeks, a majority of the soldiers are still in the custody of the Taliban, and the government has been practically forced to engage in negotiations with them. This reflects government weakness in the face of their growing strength and influence, to say the least. Pamphlets being distributed in the agency, while warning local tribes not to side with government forces, assert that "like in Afghanistan, we have established suicide squads for attacks on troops and their allies in Pakistan" (Daily Times, September 3). Earlier this year, the Pakistani army partially succeeded in tackling al-Qaeda through supporting Maulvi Nazir, a Taliban leader somewhat sympathetic to government objectives. He started an effective campaign against Uzbek militants aligned with al-Qaeda in the area and largely accomplished his goal of evicting Uzbeks from the agency. However, he is pursuing his religious agenda unabatedly, and it is hardly distinguishable from the Taliban's worldview. The death of notorious militant leader Nek Mohammad (now remembered as a hero in the area) in 2004 has helped the Pakistani army take some control out of the hands of Taliban militants, but the vacuum created by his elimination seems to now be filled, and Taliban forces have revived their influence and control. A UN report released earlier this month said that 80 percent of suicide bombers in Afghanistan had come from the Waziristan agencies. Yet while the Pakistani government has offered to introduce reforms in FATA, little has been done (Dawn, September 26). Political agents continue to dole out funds to handpicked people, often in an attempt to buy peace—hardly an inclusive policy. The $750 million worth of U.S. aid for the uplift of FATA is in the pipeline, but there is no publicly known strategy in place on how to channel the funds, leading to much apprehension and conspiracy theories about who will really benefit in the area. Furthermore, Pakistan has been rattled by 39 suicide attacks in 2007, so far killing around 350 people, and most of these attacks targeted the Pakistani army, the Frontier Corps and government officials in FATA and the NWFP (GEO TV, September 19). A series of attacks in the Rawalpindi region in August this year were especially meant to attack the Special Services Group (an elite commando unit) and the ISI. This is unprecedented in Pakistan. Many interpret these attacks as a consequence of Musharraf's tough handling of the Red Mosque crisis in July. Clearly, a majority of these attacks relate to the volatile FATA situation and the Pakistani army is now on the defensive. The killings of Abdullah Mehsud and Mullah Dadullah were expected to hit Taliban forces hard, but the Taliban are showing uncommon resilience. Indeed, Musharraf's capacity to respond militarily is curtailed because of political compulsions. For Afghanistan and the United States, this means a troublesome scenario. Pakistan's return to democracy may potentially change things for the better, but Musharraf's move in this direction is sluggish and uncertain.